The Rainbow Serpent (Serpant) dreaming in Aboriginal society represents one of the great and powerful forces of nature and spirit. Connected to water, the Rainbow Serpent is the great life giver, and protector of water, which is his spiritual home. For Aboriginal people of the desert, the Rainbow Serpent lives in the waterholes of their country, and travels between them, either under the ground or in the storm clouds when a rain storm is moving. His presence brings on the rains and if he is offended he can prevent the rains and cause drought or inundations that cause people to perish. People pay great respect to the Rainbow Serpent, especially as they approach a waterhole. They will sing out the Spirit from distance away, telling that they are coming to the waterhole, telling what their intentions are. They want to re-assure the Rainbow Serpent that their purpose is a good one, that they recognise his power, and that they intend to bring no harm or ill doing. By singing out to him, the Rainbow Serpent can hear that they have knowledge of the place and the language of that place, so that the people are recognised as being from that place. While talking to the Rainbow Serpent, the people will take a handful of earth and rub it onto their bodies, so that the he can smell them. Finally when they followed all the necessary rituals, they can approach the waterhole to drink. People believe that the power of the Rainbow Serpent is so great that he can instantly whip up a storm, high winds and driving rain, and that he quickly drown anyone who does not know how to approach him properly. As a protector of water, the Rainbow Serpent also controls water, so he has the power over life and death in the desert. 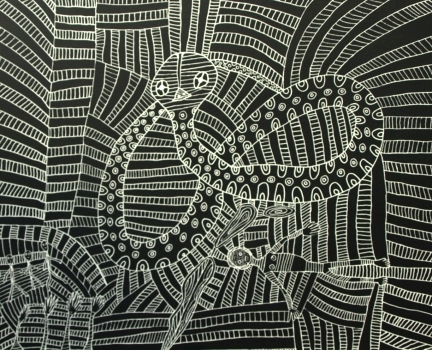 In Arnhem Land in the Northern Territory the Rainbow Serpent is associated with rituals of abundance and propagation in the natural world, and of fertility and well-being in human society. It has the power over life and death, bringing conception spirits to the water holes, but also punishing those who break traditional laws. Known as Ngalyod in the Kuninjku language of Arnhem Land, the Rainbow Serpent is linked to water sources around creeks and rivers, and is responsible for the production of water plants - waterlilies, vines and palms, that grow near water. The Rainbow Snake is held in respect because of the ability to renew life by shedding the skin and emerging anew. Aboriginal myths about the rainbow serpent often describe a fearful creature that swallows humans only to regurgitate them, transformed by her blood. White ochre is often used by artists to create the brilliant white paint for bark paintings, body decoration and rock art, that show the image of the Rainbow Serpent. 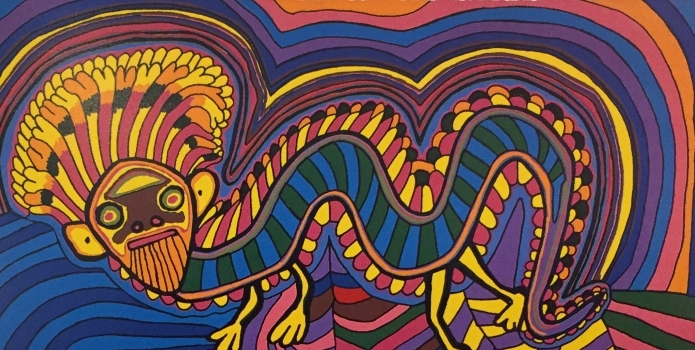 The Rainbow Serpent has many different names and totemic appearances across the many Aboriginal languages of Australia. In all those groups, the Rainbow Serpent is part of the Dreaming and Creation story, continuing to carry its power over people today. Aboriginal people today respect and take custodial care of sacred sites where the Rainbow Serpent is said to reside. Often certain activities are forbidden at these places for fear that the wrath of the great snake will cause sickness, accidents and even tempests. This is not always the case however and there are many Rainbow Serpent sites today where people may enter to hunt, fish or swim. By painting this figure on bark today, Aboriginal people are carrying on the longest uninterrupted mythological tradition in the world, which has been the subject of art and ceremony for possibly thousands of years. It remains as one of the oldest and continuous religious beliefs for human kind, and its images continue to be painted by Aboriginal artists today.